One of my best teenage memories starts with a natural disaster. In January 1998, my parents and I returned to our home in Montreal to find that a giant tree limb had ruptured our living room. What would soon be known as the Great Quebec Ice Storm had struck. It was the most catastrophic in modern Canadian history. Accumulations of freezing rain had cracked our maple tree nearly in half. It shattered our front window, glass fringing the tree limb like a body outline in a murder scene. Outside, downed power lines sparked like electric snakes. 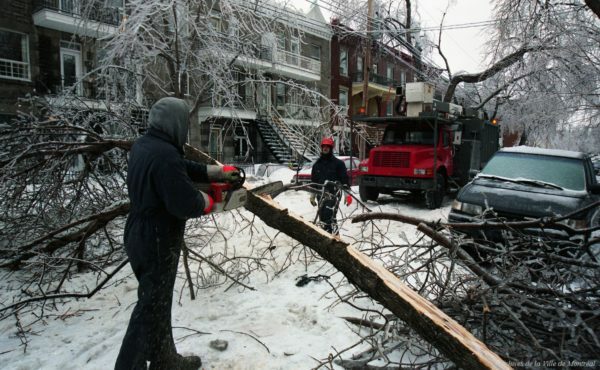 More than a million Quebecers were left without power. Cars were crushed and impaled by fallen limbs. Because the ice could inflict violence at any moment, everyone retreated indoors, making for an oddly quiet state of emergency. Except for the distant beeps of electrical-crew trucks, all you could hear was the crack of trees buckling under the weight of the ice, day and night. Long after the sidewalks were cleared, we tiptoed past the eaves of tall buildings and kept our voices low, steering clear of icicles thick as baseball bats and sharp as spikes, primed to fall at any moment. For seven days and seven nights, until the power returned, we lived by candlelight. We learned to be mindful of candles: how to stand them up, walk with them, nurture their light. At first it was maddening to cook dinner — to carefully carry a plate of candles to the cupboard, poke around for ingredients, then go off again in search of a knife, taking care not to drip wax into the cutlery drawer. I learned how to brush my teeth and bathe by candlelight; the light bounced off the mirrors, making the bathroom for once the brightest room in the house. In our bedrooms, we piled under blankets and read ourselves to sleep by the flickering flames. Outside, our neighborhood descended into darkness at twilight, but if I stared hard enough at windows blurred with ice, I could just make out little dancing lights. Decades later, no one in my family remembers what we talked about, or ate, or how we spent our afternoons that week. But we all remember the candles. I’ve since settled in California, and last January events in the world left me with a hunger for silence. I adopted a strict information diet: no television news or social media. One evening, I didn’t even bother to flick on the lights in my apartment. I walked quietly to the window and watched the last of the day, the darkness swallowing the trees along my street. Instinctively, I went looking for a book of matches in the back of the kitchen junk drawer. Opening a closet, I felt around until I discovered the remnant of a housewarming gift: a milk-white candle. I struck a match and lit the dusty wick. I commandeered a plate from the cupboard and set it on my coffee table. I nestled in a blanket, listening to the wind in the courtyard. Eventually, for the first time in too many days, I found myself surrendering to sleep. That was the start of a practice I’ve taken to calling Candle Hour. An hour before I go to bed, I turn off all my devices for the night. I hit the lights. I light a candle or two or three — enough to read a book by, or to just sit and stare at the flame, which, by drawing oxygen, reminds me I need to breathe, too. I surround myself with scents and objects I like — some fresh rosemary plucked from a neighbor’s bush, a jar of redwood seed pods. I have a journal ready, but I don’t pressure myself to write in it. Candle Hour doesn’t even need to last a full hour, though; sometimes it lasts far longer. I sit until I feel an uncoupling from the chaos, or until the candle burns all the way down, or sometimes both. Candle Hour has become a soul-level bulwark against so many different kinds of darkness. I feel myself slipping not just out of my day but out of time itself. I shunt aside outrages and anxieties. I find the less conditional, more indomitable version of myself. It’s that version I send into my dreams. At night, by candlelight, the world feels enduring, ancient and slow. To sit and stare at a candle is to drop through a portal to a time when firelight was the alpha and omega of our days. We are evolved for the task of living by candlelight and maladapted to living the way we live now. Studies have noted the disruptive effects of nighttime exposure to blue-spectrum light — the sort emanated by our devices — on the human circadian rhythm. The screens trick us into thinking we need to stay alert, because our brains register their wavelength as they would the approach of daylight. But light on the red end of the spectrum sends a much weaker signal. In the long era of fire and candlelight, our bodies were unconfused as they began to uncoil. Tonight’s candlelight will cast the same glow on my Oakland walls as it did on my parents’ walls in Montreal in 1998. I’ll feel in my bones that the day has passed — as all days, even fearful ones, eventually do. The day’s last act is cast in flickering gold. I’ll watch the flame bob and let my mind wander, until I realize I’m sleepy. After a while, I’ll lean over and blow it out, ready now for darkness — where renewal begins. Post-Theranos, Can Silicon Valley and Biomed Get Along?